Busy port operators are always on the hunt for ways to improve efficiency and boost throughput, but their efforts won't count for much if the skilled workers they depend on are out injured. To help ports protect their employees from harm, one trade group recently published health and safety recommendations for crane operators. 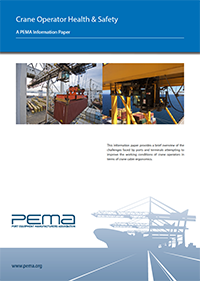 In an information paper released this spring, the Port Equipment Manufacturers Association (PEMA) outlines 20 recommendations for crane manufacturers and terminal operators on how to improve rubber-tired gantry (RTG) and ship-to-shore (STS) container crane cabin ergonomics and safety. Topics addressed in the paper include cabin vibration, maintenance, ambient temperatures, airflow, emissions, integrity of glass floors, fall risks, and visual and audio warning systems. PEMA, whose member companies include crane manufacturers, component makers, and software and automation specialists, has made the report available online free of charge. To download a copy in PDF format, go to pema.org/publications. Feedback: What did you think of this article? We'd like to hear from you. DC VELOCITY is committed to accuracy and clarity in the delivery of important and useful logistics and supply chain news and information. If you find anything in DC VELOCITY you feel is inaccurate or warrants further explanation, please ?Subject=Feedback - : Port group offers tips on crane safety">contact Chief Editor David Maloney. All comments are eligible for publication in the letters section of DC VELOCITY magazine. Please include you name and the name of the company or organization your work for.